Update as on 2017-02-15: Seems like Microsoft has removed the link to download Windows ISO. Hence the below guide is not working as of now. We will update the post, as we get a workaround to deal with it. Microsoft used to provide official download links to its Windows OS ISO over the internet until a short while back. However, Microsoft stopped providing any direct download link to its Windows OS ISO due to piracy reasons. When the Windows 10 came out, Microsoft created a tool called Media Creation Tool. Upon installation this tool will check your PC for Genuine Windows OS Key, if found, you can download the Windows 10 ISO or installation file directly to your computer. The Media Creation Tool is a good way to upgrade your PC to Windows 10. This allows you to download the Windows ISO or the installation file as per the requirement. However, this method of downloading Windows 10 ISO can be slower at times and in case something goes wrong you may have to download the ISO from all again. To tackle this issue, Microsoft created a web page called Tech Bench program. If you visit the Microsoft Tech Bench program web page, you will be able to download Windows 10 ISO in your preferred language. But, what if you want to download other versions of the Windows OS including Windows 7, Windows 8 and Windows 8.1 ISO directly from the official Microsoft website? You can do that as well. Thanks to few Windows leakers, now you can download Microsoft Windows 7, Windows 8.1 and the Windows 10 ISO directly from Microsoft. By default, Microsoft has kept the direct download links to other Windows versions hidden. But, that can be made visible with a small script that needs to be executed in your Chrome or Firefox browser. Here, I will show you how to download Windows 7, Windows 8, Windows 8.1, Windows 10 ISO directly from the Microsoft website. Begin with visiting the Microsoft Tech Bench Program web page (link removed officially by Microsoft). The web page shows the option to download the latest edition of the Microsoft Windows, which at this time would be Windows 10. To make other options available, we will be using a script that needs to be entered in the web browser. Make sure that you are in the Tech Bench page while pasting the code. Press Ctrl + C to copy the above code. Now when you are in the Tech Bench Program page and can see the select an edition section, press Ctrl + Shift + J (Chrome) and Ctrl + Shift + K (Firefox). A Console section will open at the right side of the webpage. Press Ctrl + V to paste the code and hit Enter. If you are using Firefox, you may see a warning while trying to paste the script. Type Allow pasting in the console hit enter and then paste the code (Firefox only). If the script worked successfully, a drop-down menu would appear now in Blue color. Clicking on the Drop-Down menu would show you the list of all the Windows OS versions including Windows 7, Windows 8, Windows 8.1 and Windows 10 official ISO direct download links. 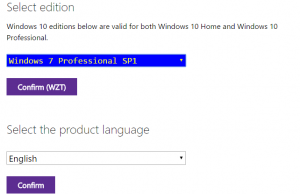 Now select the Windows Edition ISO that you want to download and click on Confirm. Next, you will see a wait screen showing validating request message. Next, you have to select the language in which the ISO needs to be downloaded. Select the language and click on Confirm button. Next, you will see download buttons to download both the versions (32-bit / 64-bit) of the selected Windows Edition. Click on the Windows Edition that you want to download and the download should begin shortly. It is recommended that you download both the version of the ISO just in case. Note that the download links are only valid for next 24 hours. So, finish the download before 24 hours. Great, that worked very well. Do exactly the same on the Windows 10 ISO page.